Preparing your rats for a rat show is in many ways strongly linked to excellent husbandry and general health care. Rats who live in a rich and appropriate environment, get lots of physical activity and exercise and eat a healthy diet are much more likely to be alert, fit and in great overall condition. However, there are specific things that you can do to ensure that your rats look as good as possible on the show day. It is important to do this before entering your rats and then again on the morning of the show. Rats who show any signs of illness, infestation, lack of condition or age related decline should not be taken to a show. A day travelling and showing is physically taxing for any rat, and only those in the best of health and fitness should be expected to participate. 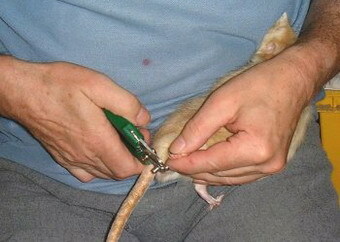 Travelling and showing a vulnerable rat is likely to lead to a deterioration in their condition. Face - look for signs of swelling (abscess, injury). Mouth - check for overgrown or malaligned teeth (abscess, injury). Chin - check that there are no scabs (mites). Nose - look for red discharge or noisy breathing (upper respiratory infection, stress). Eyes - look for red discharge (infection, stress), swelling or cloudiness (injury). Ears - check that they are clean and free from scabs (sarcoptic mites). Chest - listen for any noise, wheeze or rattle and look for heavy or very rapid breathing (infection). Body - check for scabs and wounds (parasites, injury or fighting). Tail - should be clean and smooth, free from cuts and damage (injury). Coat - be sure that is is clean, glossy (except rex) and that there are no bald areas (except rex). Skin - look around the rump and groin for lice at skin level. Check for redness, scaliness, and excessive dandruff (infection, poor condition, underlying illness). Weight - make sure the rat is neither under or significantly overweight. Internally - Gently palpate the abdomen looking for lumps taking care to check underarms and in groin (mammary lumps, tumours, abscesses, enlarged organs/lymph nodes). 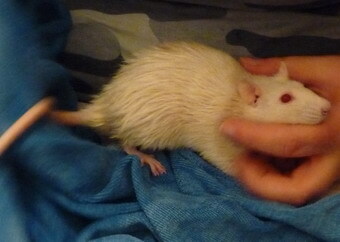 Regarding the risk of infestation, many people choose to treat their rats with a drop of Ivermectin (or similar) in advance of the show to give them protection from parasites. This is a matter of personal choice. Some people prefer to only treat should an infestation occur. All rats attending NERS shows are checked for obvious signs of infestation. Excellent nutrition with lots of fresh vegetables to supplement a balanced grain mix will help to keep your rats in great condition all of the time. About a week before the show you may wish to give a little 'good' oil, such as Salmopet (fish oil), olive oil or flax oil, just a few drops on a cube of wholemeal bread. This will help to give a lovely gloss to your rats coat. The evening before the show the rats who will be travelling will need a high carbohydrate energy meal, to help sustain them through the rigors of the show day. Wholemeal pasta is good for this purpose, and you can mix in a little olive oil, garlic, chopped vegetables and/or chopped boiled egg if you like. If the rats are still growing adding a protein food like egg/fish or chicken is probably wise. This meal is supplementary to their normal dried mix. On the morning of the show you will probably be getting your rats out of bed, and they are unlikely to eat a great deal whilst travelling, but nevertheless they should have dry food and a moisture source available. It's best not to travel them with sloppy foods such as baby food as they can get into quite a mess. Good moisture sources are fruit or vegetables that are mostly water, such as cucumber or melon. These can be soaked overnight in the fridge in icy water to be as wet and chilled as possible. Don't travel with water bottles attached as these tend to leak, but it's best to take water bottles along to attach to carriers whenever you are stationary. Also remember to take along some nourishing food for the end of the show (a pasta/sweetcorn/chickpea type of mix is good for this purpose and not too messy whilst travelling home). 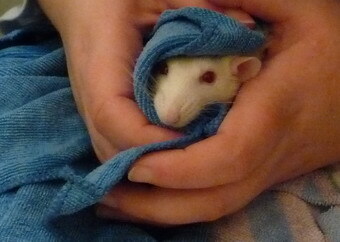 Many people wonder whether it is necessary to bath rats and the answer is generally no. Rats are compulsively clean and spend a good deal of time washing and grooming themselves and each other. When they are kept in a clean environment it is unusual for them to become dirty unless they are ill or very old. Bathing removes essential oils from their coats and can lead to a lack of condition. Most rats dislike being bathed though some of them enjoy paddling themselves in warm water so long as they are in control and not being forced into it. Paddling and pea-fishing can be a fun game, and is a good way of helping to keep their tails clean - their tails being the only part of them that they seem to find it hard to spruce up themselves. Good diet will also go a long way to preventing an over oily coat or excessive dandruff. All bucks produce an oily substance on their backs (known as buck grease), which is orange in colour, and can be seen when the coat is parted. This is normal and does not need to be removed. If you do wish to bath your rat (and some paler varieties might need this) run a sink full of warm water (pleasant but not hot to the touch). 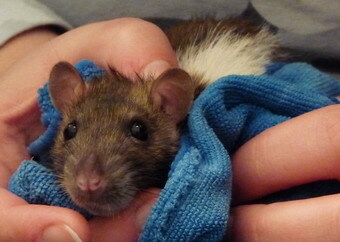 Dilute a little baby shampoo (or small animal shampoo) in a bowl and work into the rat's coat, avoiding the head. Rinse in the sink of water. A second rinse may be needed to remove all traces of soap. 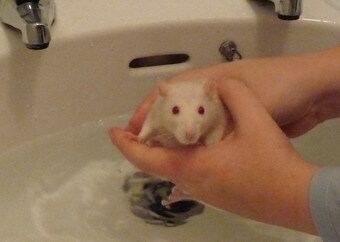 Do not hold your rat under running water, as shampoo or water can get into ears, eyes or be accidentally inhaled. The tail should be washed separately and this can be done using a firm toothbrush or a small piece of green plastic scouring pad torn from a sponge 'scourer'. Use a little washing-up liquid and run the pad down the tail holding firmly but gently from base to tip, or scrub gently with the brush. To avoid being scratched it is best to bath your rat after cutting her nails. After washing, towel dry as thoroughly as possible. Most rats do enjoy this part. 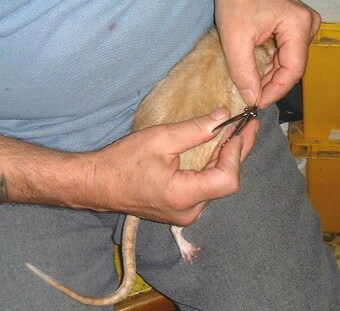 Cutting claws is an essential part of show preparation, but also a skill that is worth learning even if you don't want to show your rats, as it will make your rats more pleasant to handle. Individual rats wear their own nails down to varying degrees (some even trim their own! 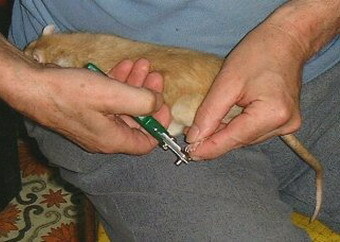 ), but many of them retain long sharp claws unless you regularly remove the tips. Some people find it easiest to clip nails with a small human nail clipper, and some might prefer small sharp scissors or specially designed claw cutters. Sit down in a good light. Hold the rat fairly firmly against your body with your left arm, with its head tucked under your arm and its outside (right) back foot held firmly in your left hand (reverse if left-handed). If the rattie struggles simply reposition. You may need to do this 2 or 3 times before the rat submits to you. Once the rat is still, move as swiftly as possible and snip the fine pointed tips off the back claws of the rats outside foot. Having completed one side turn her around and repeat the process for the other hind foot. With a little more practice you can also attempt the front feet but these are harder to keep hold of, and the nails are finer and generally not as damaging. 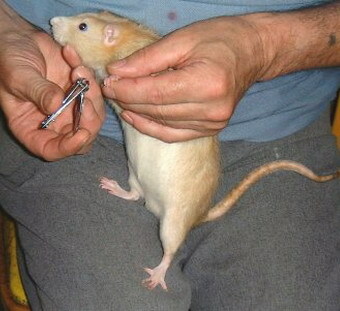 It is in the rat's interests to clip its claws regularly because this will prevent it damaging its skin whilst scratching.